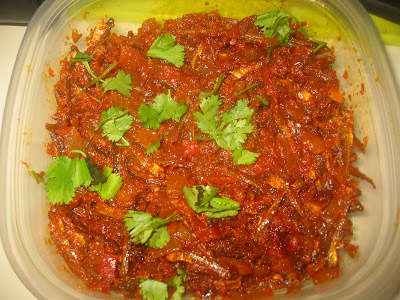 Another taste bud of my hometown which is very popular among seafood lovers.Due to bad climates changes my tongue wants to consume and enjoy some spicy food like these prawn cooked in sambal paste.A flavorful prawn dish that combines Malay, Chinese and Indian ingredients.This dish is very delicious served with Nasi Lemak or any rice dish. In wok add 3tbsp oil and add mustard seeds. Once the seed starts to crack add the chopped onions and tomatoes. Sauté them till they become tender and pour the sambal paste and bring to a boil. Once the paste starts to boil add the prawns and cover with lid. Let the cook well in the paste for about 10 minutes or until the oil starts to separate. Remove the lid and adjust the level of salt and serve hot with steaming white rice. Wonderful meal can i join for the lunch but u have to make egg sambal for me sariya? I love to try ur yummy dish da but i couldn't find shrimp paste in stores. Can i make this recipe without shrimp paste and anchovy. Does it taste as good as you made? Superb!!! i m drooling..I love prawns..Perfect with hot rice..
prawns sambal looks absolutely delicious Sara!! my bro-in law is from malaysia, so, he's the one who introduced the sambal to me and I do a similar preparartion too; this recipe is nice!! thank you for the recipe !! Thanks girls for the encouraging comments.Mythreyi u can omit them if u cannot find the ingredients..it will taste good too.You should be able to get them in the Asian stores dear or those shop that sells international food stuffs..